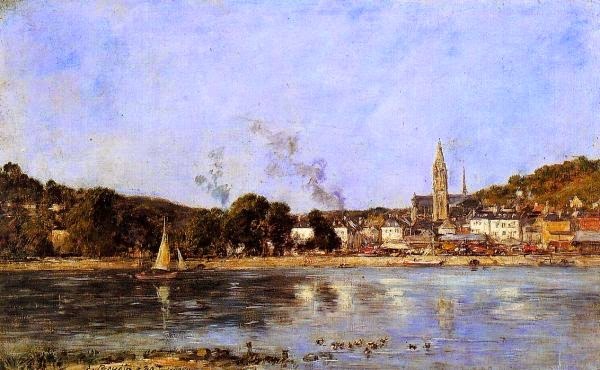 painting by Eugene Boudin (1824-1898). Boudin was a leader of the French movement to paint outdoors, and nearly all his works include a view of water. This is is a rare example of Boudin doing a study of still water in contrast to the dozens of works of sea and sky of his native Normandy. The tower of Notre Dame still dominates the town; the Seine's surface, glassy in parts and turbulent in parts, catches the reflections of the whitewashed structures in the full sunlight. This is a picture of increasingly stable, civilized world as the Seine is traced from the sea to the cultural heights inland.